Helen and Adrian welcome you to Pathend, our Victorian former Factor’s house, set in the picturesque coastal village of Lochcarron. The house offers lovely sea and mountain views and is ideally located for exploring some of the finest scenery in Scotland, such as The Applecross Peninsula, Torridon, Plockton and the Isle of Skye. We are also on the famous Wester Ross Trail which is almost 150 miles of some of the most spectacular scenery in Europe. 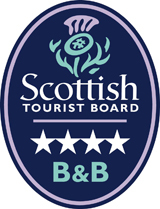 Between us we have more than 40 years in the hospitality and catering industry and so you will be assured of a warm welcome, a comfortable stay and a particularly hearty breakfast. Evening meals and packed lunches also available with prior notice. with full board Christmas package available .